Blackstrap molasses is the dark, viscous molasses that remains after maximum extraction of sugar from raw sugar cane. It has the consistency of a thick syrup, as the third boiling of sugar syrup yields blackstrap molasses. This concentrated byproduct is left over after the sugar’s sucrose has been crystallized. It has a robust flavor described as bittersweet. Unlike refined sugar, blackstrap molasses contains essential vitamins and minerals — boasting a number of powerful health benefits. As the nutritional benefits of blackstrap molasses becomes better known, more and more molasses products are being sold in the supermarket. As opposed to refined sugar, molasses has the power to naturally relieve PMS symptoms, stabilize blood sugar levels, improve bone health, treat symptoms of ADHD and boost skin health. Blackstrap molasses contains the vitamins and minerals that it absorbs from the sugar cane plant. Molasses has a moderate glycemic load of 55, which makes it a better choice than refined sugar, especially for people with diabetes. It contains high levels of vitamin B6, manganese, magnesium, potassium, iron and selenium. Blackstrap molasses is a high source of iron; women need more iron than men, according to the Centers for Disease Control, because they lose a certain amount of iron during their normal menstrual cycle each month. Starting at around the time of adolescence when a woman begins having her menstrual cycle, her daily needs of iron increases, but then the level decreases once again as the woman reaches menopause. Iron can also improve your mood, which relies on a balance of hormones — including serotonin, dopamine and other vital hormones — that cannot properly be synthesized in the brain when oxygen levels are low. This is why iron deficiency sometimes results in a poor mood, bad sleep, low energy levels and a lack of motivation. If you notice changes in your mood and feelings of mild depression or anxiety, especially during menstruation, an iron deficiency could possibly be a contributor. Also, essential minerals in blackstrap molasses, such as magnesium, manganese and calcium, prevent the clotting of blood, which relieves menstrual cramps and maintains the health of uterine muscles. B vitamins, calcium and magnesium each play a role in combatting stress and anxiety, and blackstrap molasses contains all these vital minerals. Vitamin B6, for example, raises serotonin levels in the brain. This is an important hormone that controls mood and prevents pain, depression and fatigue, and blackstrap molasses’ vitamin B6 content makes adding it to your diet a great way to bust stress. A 2004 study published in Psychotherapy and Psychosomatics found that low levels of vitamin B6 causes depression, as the vitamin contributes to the tryptophan-serotonin pathway. Of the 140 participants, 13 percent of them were evaluated as depressed andvitamin B6-deficient. Although this is not a staggering number, the research suggests that the vitamin deficiency is correlated to depression levels and needs to be addressed in patients who have symptoms of moodiness and depression. Blackstrap molasses helps stabilize blood sugar levels, which can be extremely beneficial for people with diabetes. It has a low glycemic index and naturally slows the metabolism of glucose and carbohydrates — resulting in less insulin production. Blackstrap molasses also contains a high level of chromium, which increases glucose tolerance. Chromium plays a role in the insulin-signaling pathways that allow our bodies to control the amount of sugar we take in, helping balance blood glucose levels and giving us stable energy. A 1997 study conducted at the U.S. Department of Agriculture suggests that chromium is an essential nutrient involved in normal carbohydrate and lipid metabolism. In the study, 180 individuals being treated with type 2 diabetes were either given a placebo or chromium supplements over a four-month period, while continuing to take normal medications and not changing eating habits. As a result of chromium treatment, insulin values and cholesterol levels decreased significantly compared to the placebo group. This study did have patients continue their normal medications for treatment diabetes, so it is important to note that chromium consumption seems to be only partly responsible for the positive results. A 2009 study published in the Journal of the American Diabetic Association suggests that blackstrap molasses serves as a nutritious alternative to refined sugar because it offers the potential benefit of antioxidant activity. Antioxidants are substances that help prevent certain types of cell damage, especially those caused by oxidation. Oxidative damage plays a major role in disease today and has been linked to health conditions including cancer. High-antioxidant foods, like blackstrap molasses, help reduce free radicals in the body, which are believed to be the primary cause of cancer. According to the National Cancer Institute, free radicals are formed naturally in the body and play an important role in many normal cellular processes; however, at high concentrations, free radicals can be hazardous to the body and damage all major components of cells, including DNA, proteins and cell membranes. Blackstrap molasses contains lactic acid, which is produced by bacteria that plays an important role in carbohydrate metabolism. Lactic acid serves as a natural acne treatment and heals other skin conditions. A 2002 study published in the Indian Journal of Dermatology, Venereology and Leprology found that lactic acid worked as a preventative solution for acne. The study involved 22 patients who experienced lesions, inflammation and cysts. Lactate lotion was used topically all over the face twice a day, and then it was used like a cosmetic for a year. At the end of one year, 90 percent to 100 percent reduction of the inflammatory lesions was achieved in 41 percent of the patients, and non-inflammatory lesions reduced in 23 percent of the patients. The remaining patients showed 50 percent to 90 percent reduction, while two patients showed less than 50 percent reduction in the non-inflammatory lesions. This research suggests that lactic acid treatment results in significant reduction of acne symptoms, including the development of lesions. Blackstrap molasses also promotes the growth of healthy tissues, so it serves as a natural wound healer. Consuming blackstrap molasses accelerates the healing time of cuts, wounds, burns and signs of acne — helping you maintain clear and healthy skin. Because blackstrap molasses serves as a high source of calcium, it promotes strong and healthy bones. Since we lose calcium every day through our skin, nails, hair, sweat, urine and stool, and we cannot make it within our own body, it’s important that we eatcalcium-rich foods regularly. Calcium is the most present mineral in the body, stored in the body mostly in the bones and teeth. About 99 percent of our calcium is found in bones and teeth, mostly in the form of calcium deposits, with the other remaining 1 percent being stored throughout bodily tissue. Calcium is involved in the growth and maintenance of bones. Without enough calcium present in the body, known as a calcium deficiency, bones are susceptible to becoming weak and pliable, making them prone to fractures and breaks. The calcium, plus the iron and copper levels, in blackstrap molasses undoubtedly improves bone health, helps heal broken bones, and reduces the risk of weak and brittle bones. Research has shown that the same symptoms evident in children with ADD/ADHD are also seen in people who are nutritionally deficient in zinc, magnesium, calcium and iron. ADHD and ADD are neurological and behavior-related conditions that cause difficulty in concentrating, impulsiveness and excessive energy. Individuals with ADHD not only have a challenge in concentrating, but have a challenge sitting still. Sugar is a major problem because it causes blood-sugar spikes, causing hyperactivity. Then as blood-sugar levels spike down, a person loses focus. Blackstrap molasses is a more nutritious alternative to refined sugar, and it does not have the same effects on blood-sugar levels. Also, consuming molasses provides iron and B vitamins — which have the ability to remedy ADHD naturally. These vitamins and minerals support the nervous system and brain function, improving focus. Arthritis is a joint disease that causes swelling and pain in the joints. It’s either classified as osteoarthritis or rheumatoid arthritis. Osteoarthritis occurs when cartilage between joints wears down, causing inflammation and pain, and rheumatoid arthritis is caused by an autoimmune dysfunction where the white blood cells destroy the cartilage. Because of the anti-inflammatory properties in blackstrap molasses, it relieves swelling and joint pain, working as a natural arthritis treatment. Just two teaspoons of this, rich all-natural syrup contains 10 percent of the daily recommended amount of potassium. Potassium-rich foods help lower systolic blood pressure, lower cholesterol and support a healthy cardiovascular system, in addition to helping cleanse your liver. Potassium also plays an important role in keeping the body hydrated and works with sodium to support cellular function with your body’s sodium-potassium pump. Blackstrap molasses has been imported from the Caribbean Islands since the time of the first settlers. Because it was much more affordable than refined sugar, molasses was popular up until the late 19th century. In fact, molasses was so popular that the British crown passed the Molasses Act of 1733 in order to discourage colonists from trading with the West Indies, which was not under British rule. Colonists had to pay six pence for every gallon of molasses, which was commonly used in rum and spirits at the time. The growing corruption of local officials and the bitterness and resentment of British Law that was caused by this act only continued with the passing of the Stamp and Townshend Acts; by 1776, the colonists were fighting for their independence from British rule during the American Revolution. Since then, blackstrap molasses has made a comeback. This is due to the “health food movement” that is popularizing nutritious and vitamin-filled foods. The largest producers of molasses are currently India, Brazil, Taiwan, Thailand, the Philippines and the United States. It’s easy to find blackstrap molasses at your local market or health food store. When purchasing blackstrap molasses, look for products that are organic and unsulfered. Blackstrap molasses is commonly used as a natural sweetener and sugar alternative. Molasses has a unique, rich flavor. Some people use it as a spread or topping on toast, oatmeal and porridges. It’s also a great sweetener for marinades, barbeque sauce and to use while baking. You can even add blackstrap molasses to coffee — it intensifies the richness of the coffee while lowering the acidic taste and enhancing coffee’s nutritionvalue. Blackstrap molasses serves as a brown sugar alternative, too; you can use molasses to create brown sugar by adding two tablespoons of molasses for each ½ cup of coconut sugar that a recipe calls for. Put the coconut sugar and the molasses in a food processor, and pulse until the consistency of commercial brown sugar is reached. The result is a more nutritious “brown sugar” that still tastes great. Blackstrap molasses is about two-thirds as sweet as refined sugar, but it can be used in recipes that call for brown sugar, honey and maple syrup. 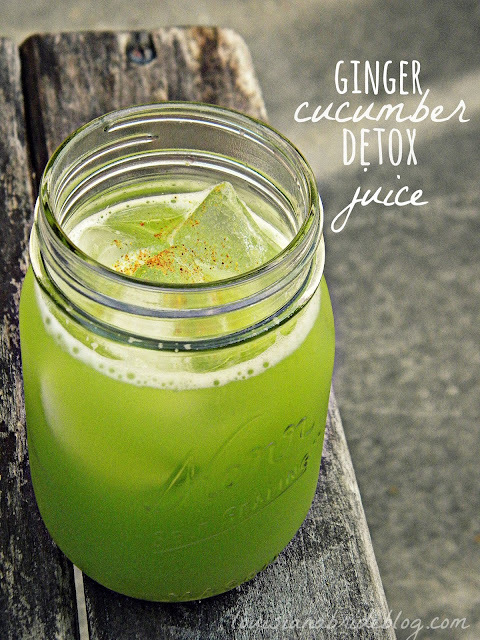 Try experimenting with this nutritious product today — you’re going to love it! Because blackstrap molasses can sub in for maple syrup, trying using it in my Maple-Glazed Rosemary Carrots Recipe. The bittersweet flavor of molasses goes perfectly with the rosemary in this recipe. Another way to use blackstrap molasses in place of maple syrup is with my Gluten-Free Cinnamon Buns Recipe. This recipe is delicious, healthy and gluten-free! The texture of molasses compliments the stickiness of a cinnamon bun too. Blackstrap molasses is commonly used to make marinades, sauces and glazes. You can use molasses in place of honey; it provides the same texture and a slightly bitter flavor. My Grilled Honey-Glazed Salmon Recipe would be perfect for blackstrap molasses because it creates the thick consistency that works perfectly for salmon glazes. 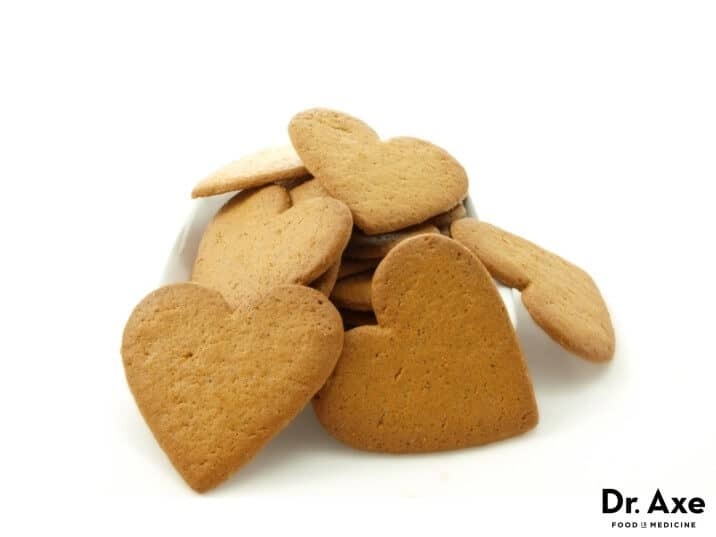 This gluten-free gingerbread cookies recipe is delicious! It satisfies sweet cravings without the processed sugar. Blend dates in a food processor until chopped finely, then add oil, molasses and ginger while processor is running. Add flour, baking soda, cinnamon, nutmeg, cloves and sea salt to food processor slowly and process until dough-like. Flour your counter or workspace, then roll out the dough until approx 1/4″ thick. Cut shapes with cookie cutters or squares with a knife. 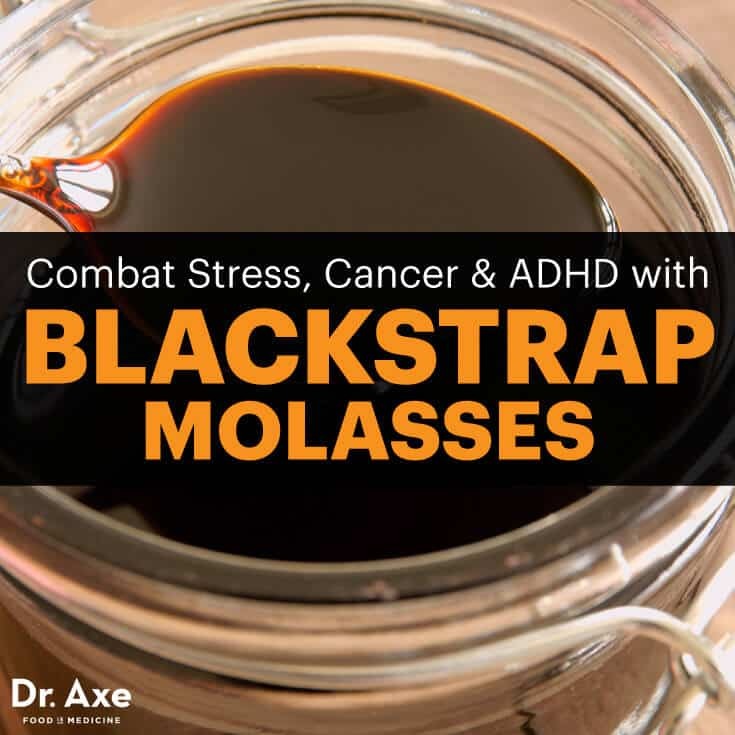 It’s perfectly safe to consume blackstrap molasses in food amounts, and it supplies the essential vitamins and minerals that keep your body functioning properly. Some people might develop allergic reactions to molasses due to a sensitivity toward the sulfite present in sulfured molasses. For this reason, I suggest you purchase unsulfered blackstrap molasses. Also, keep in mind that the glycemic index for molasses is 55, which is moderate and means that people should not consume large amounts of it. It should be used as a more nutritious sweetener.